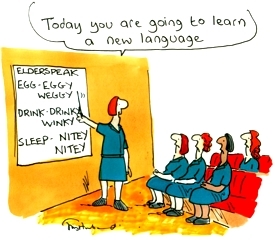 Elderspeak is not something that is commonly taught in the healthcare professional’s curricula. Therefore, many of us are not aware that we are using it or of the negative consequences of this stereotypical behavior. Elderspeak is a form of baby talk frequently used by health care workers. It is a patronizing and demeaning form of address that tends to irritate older people. The doctor who talks to the senior’s adult child rather than to them about their health. Talking down to or ignoring an elder’s ability to speak and understand for herself. The healthcare worker commanding a person to do something as if speaking to a child, such as “why don’t we go to bed (this type of language assumes dependency and is demeaning. Using “dear, honey or sweetie” when addressing a senior. Elderspeak appears to be a speech pattern based on stereotypes not actual behavior because we frequently hear it used in situations where older adults are clearly functioning well such as in banks and restaurants. Researchers in the field of Gerontology have documented that elderspeak can diminish an older person’s confidence in his or her abilities and can be damaging to an older person’s self-esteem and self-perception (O’Connor and Rigsby 1996). A study by Herman (2009) showed that patients in nursing homes with dementia tend to be more resistive to care with when elderspeak is used. There are many positive ways to talk to our elders. Using a rich and varied vocabulary makes any conversation more interesting . O’Connor, B.P., and Rigby, H. (1996). Perceptions of baby talk, frequency of receiving baby talk, and self-esteem among community and nursing home residents. Psychology and Aging, 11, 147-154. Williams, K., Herman, R., Gajewski, B., & Wilson, K. (2009). Elderspeak communication: Impact on dementia care. American Journal of Alzheimer’s Disease & Other Dementias, 24, 11-20. I am so appreciative of guest bloggers. Not only do they save me from coming up with a new topic for the week, but they give me a fresh perspective on the process of living our lives in rich abundance. Or as this week’s blog points out, ways to be more respectful of anyone. You know, I never talked to my children using the babytalk version of elderspeak, so why would I use it with anyone older?